Understanding how to manipulate, deploy and leverage Apache Spark is quickly is essential for businesses steeped in “big data.” It’s apparent that learning Apache Spark should be a priority for developers all over the world. 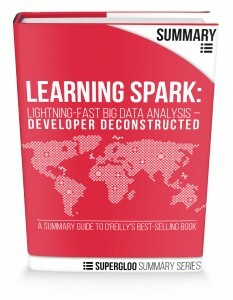 This is a book summary of Learning Spark: Lightning-Fast Big Data Analysis from O’Reilly Media, Inc. This summary will help you become more confident and productive in Apache Spark quickly. Apache Spark core fundamentals and ecosystem presented succinctly. Saves your time from re-reading the 250+ page book to re-absorb, remember and categorize concepts. Everything has been organized for you.